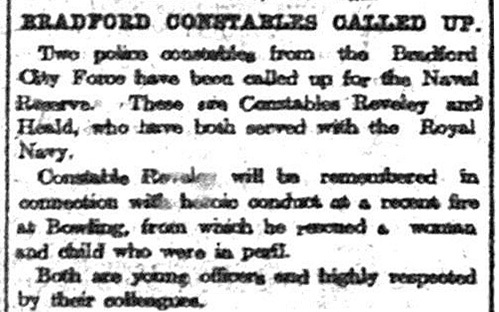 Even before war was formally declared, newspaper readers in Bradford were being made aware of the imminent and catastrophic events unfolding in Europe. 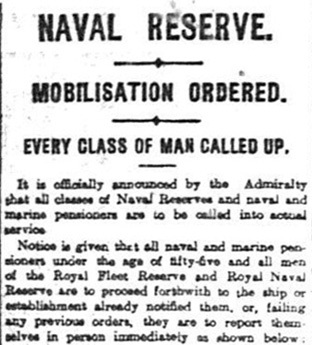 At Midland Station in Forster Square on Monday 3 August a party of Naval Reservists were seen off by their enthusiastic work colleagues. The Bradford Daily Telegraph described this as the first touch of war enthusiasm made manifest. No sooner had the men arrived at work that morning, Government envelopes were placed in their hands and they knew the time had come for them to leave. The men went straight back home to don their uniform and pick up their kit bags which were already prepared. 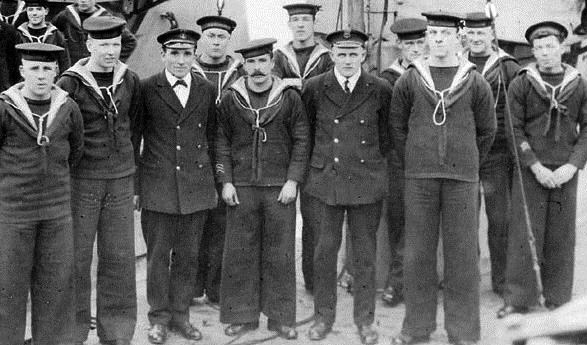 The Naval comrades were regarded as heroes already and could have had anything they wanted from the crowd. First there was a ‘farewell refresher’, drunk to the accompaniment of a lusty rendition of For they are Jolly Good Fellows. At the station kiosk there was a run on cigarettes, cigars and tobacco with dozens of packets of ‘Woodbines’ being pushed into the sailors’ kit bags. A great crowd of holiday makers showed even more enthusiasm and sang “Rule Britannia” and the National Anthem. With deep earnestness and bared heads the entire crowd joined in. Behind the crowds, small groups of women, some of them with prams, tearfully looked on. 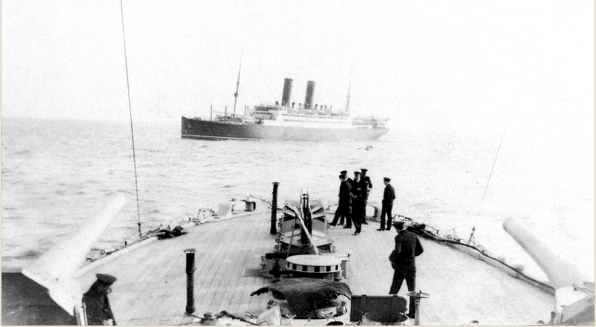 One young man kissed his wife and child saying, “Cheer up, we will soon be back!” The men boarded the 10.25 Express to Bristol from where they would disperse to their units in Devonport, Portsmouth or wherever the War Office decreed. 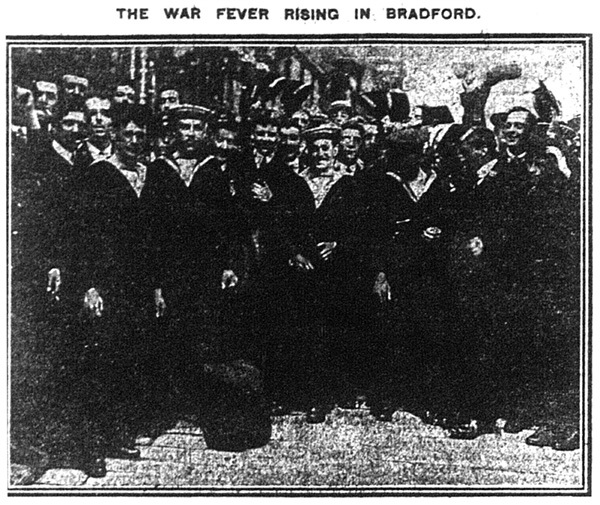 The first real touch of war fever was seen in Bradford this morning when some of the members of the Royal Fleet Reserve left the city. The men connected with the Post Office, and were seen off by an excited band of Post Office employees. Our picture shows some of the men surrounded by cheering comrades in Kirkgate. 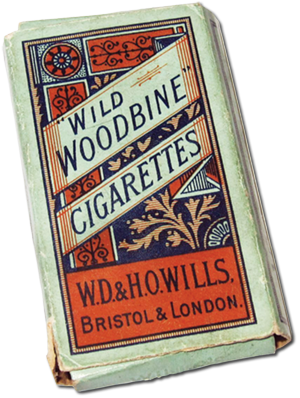 At the station kiosk there was a run on cigarettes, cigars and tobacco with dozens of packets of ‘Woodbines’ being pushed into the sailors’ kit bags. 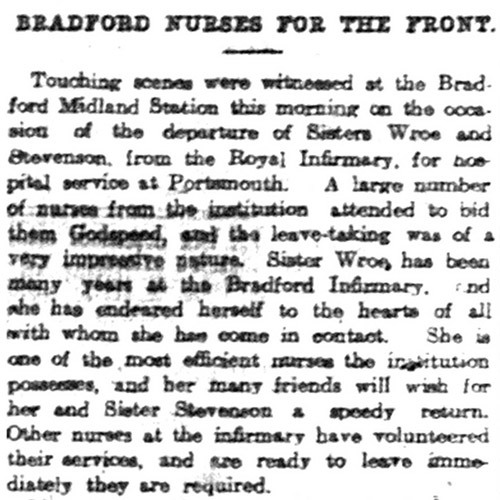 On the same day the newspaper reported a slightly smaller crowd gathered at the station to wish ‘Godspeed’ to nurses from the BRI. 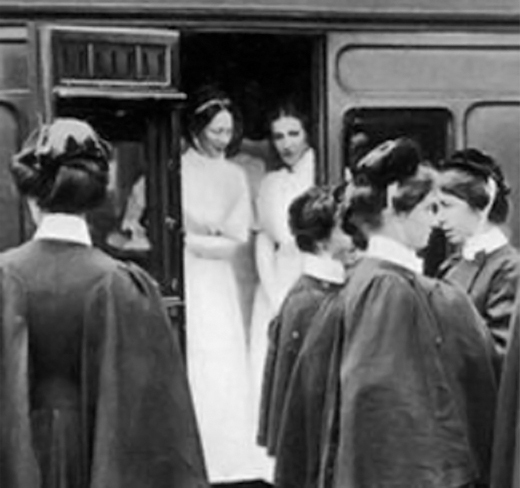 Sisters Wroe and Stevenson were to be the first from the Infirmary to volunteer: many others were ready to leave at a moment’s notice. Sister Wroe had worked for many years at the hospital and was described as one of the most efficient nurses the institution possessed.